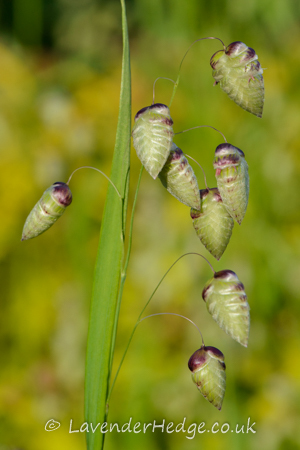 I love quaking grass or Briza media. I love the way it bobs around in the slightest of summer breezes and the way it turns a golden buff colour as it matures. I even love the way it obliging re-sows itself for the following year. Generally, the self-sowing is not really a problem as it is easy to identify and pull up what I don’t want. I usually wait until it is sufficiently large enough to handle, rather than to try and pull out tiny seedlings. However this year, because we have had such a mild, wet winter, they seem to be making a takeover bid in the garden. Also, as I have not been able to get on our soggy, clay soil to weed until quite recently, the seedlings have grown into quite sizeable clumps, and it is proving to be quite challenging to remove all the soil from the roots. I will grow it again this year, but maybe I will try and dig most of it up before it sets seed. Then again, I might just leave it and let it strut its stuff!